Lead your organization to implement innovative learning environments that increase student ownership so they can achieve at high levels and meet rigorous standards. 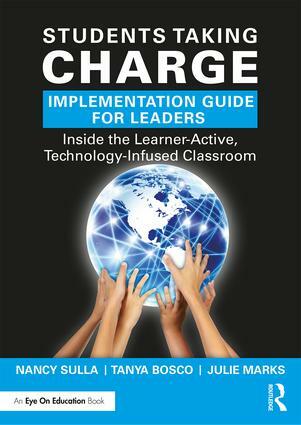 Students Taking Charge Implementation Guide for Leaders shows you how to inspire, coach, and support teachers to create student-driven classrooms that empower learners through problem-based learning and differentiation, where students pose questions and actively seek answers. Technology is then used seamlessly throughout the day for information, communication, collaboration, and product generation. Employ leadership strategies that will move teachers and students from engagement to empowerment to efficacy. This new implementation guide for school leaders offers a more detailed look into the key mindset shifts that are critical for leaders of a Learner-Active, Technology-Infused School. With the book’s practical examples and step-by-step guidelines, you’ll be able to help your teachers implement innovative classrooms immediately. Nancy Sulla is an author, national speaker, and thought leader in transforming learning environments to build student engagement, empowerment, and efficacy. As the creator of the Learner-Active, Technology-Infused Classroom™ and founder of IDE Corp. (Innovative Designs for Education) and EdQuiddity Inc, Dr. Sulla leads her educational consulting firm in the pursuit of equity-focused instructional design, positioning students to change the world. Learn more at nancysulla.com. Tanya Bosco is passionate about changing students’ lives through meaningful learning and empowering educators with the ability to create classrooms that do that. As the Executive Vice President of IDE Corp., a professional development provider, Tanya facilitates transformational professional development for schools and school leaders. She is a former high school and middle school English and public speaking teacher, and holds both a MAT and an MBA. Tanya’s most important roles are that of mom, wife, and daughter. Julie Marks is the principal of Chester W. Taylor Elementary School in Pasco County and led the school to be the first fully LATIC school in the state of Florida. She began her career as a teacher at both the elementary and middle school levels before moving into the role of school leadership. Julie earned a Master’s in Educational Leadership at the University of South Florida. While at Chester Taylor, she has been recognized as Elementary Principal of the year and District Administrator of the Year finalist in 2016 and 2018.